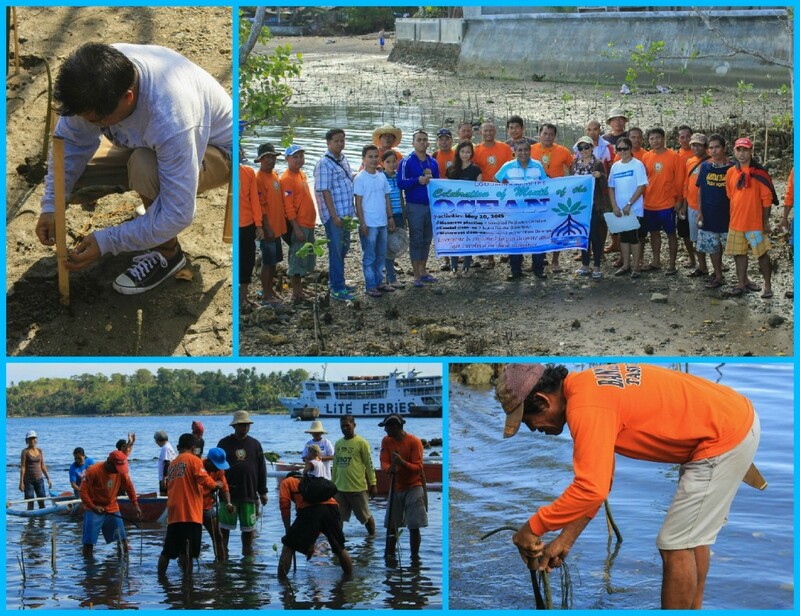 The Municipality of Jagna celebrated May as Month of the Ocean thru mangrove planting at the Pagina-Poblacion seashore last May 21, 2015. Whereas in the previous years the municipality is into underwater and coastal clean-up, this year’s identified activity is to promote the mangrove or pagatpat as the best natural barrier to giant waves. Apart from mangrove planting, upland barangays were encouraged to clean their rivers, canals and waterways of debris in preparation for the rainy season. Their contribution will be that no more garbage and debris from the upland going to the seas harming marine organisms. Spearheaded by the Municipal Agriculture Office and the Bantay Dagat Task Force, mangrove seedlings were procured for this specific activity to be planted by the LGU employees, civil society volunteers and all those who answered the call for the activity. In the latter part of 2014, Jagna was greatly affected by typhoon Queenie which brought in five-foot waves. Surprised, the fishermen were not able to secure their boats and some residents along the coast evacuated for fear of their lives. There were people who lost their homes to the windwaves generated by typhoon Queenie and boats totally damaged. Equipped with the knowledge that the mangroves will provide protection to the coastal inhabitants, the LGU is promoting the planting of mangroves in the coastal barangays of the town. Mangroves act as buffer to giant waves protecting the coasts from waves generated by typhoons, storms and waves that may be generated by earthquakes. Mangroves are also known to be the nesting area of fishes (roots) and birds (branches). Mangroves also provide food for other marine organisms. The benefit of the mangroves is immense. It is an assurance of food security to humans. The LGU is on the planning stage of conducting IEC to coastal barangays and encourage them to plant mangroves in their jurisdiction.